Hello friend! Thanks for joining me! 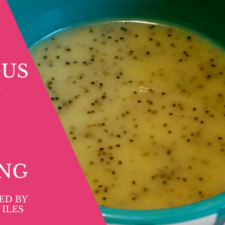 Today I’m sharing a summery salad dressing that is one of my staples for adding zip and zing to any meal. It’s fairly simple and us healthy eating types typically have all the ingredients needed right in our cupboards! With summer really hitting her stride, we’ll all be incorporating more delicious salads into our diets and one of the easiest ways to ensure we don’t get bored with Mother Nature’s beautiful bounty is by changing it up with lots of yummy dressings and vinaigrettes! It’s also super important to make sure you’re eating healthy fats with your salads because many of the vitamins and nutrients are much more readily absorbed in the presence of fat. I love incorporating lemon into my diet wherever possible because this tangy citrus fruit is an excellent source of vitamin C, which is a necessary component of the antioxidant glutathione. But lemons don’t just beautify with their vitamin C, they also help support the production of liver enzymes thereby improving our detoxification capacity. Due to the myriad of toxins we’re exposed to on a daily basis proper detox is essential for optimal health, which includes glowing skin free from discoloration, acne, and flakiness. I’ve also found that they help stoke the digestive fire and ease common complaints such as gas, bloating, or burping. Another great addition to this dressing is apple cider vinegar, one of my all time fave ingredients to use internally and externally! This living food is a fabulous staple to incorporate into your regular diet because when it is unpasteurized it is an amazing source of probiotics. Probiotics literally translates to “for life” and ensuring adequate intake helps boost immune and digestive health. I’ve also been known to take a small shot, about 2 tbsp., before meals to help improve stomach acidity and protein digestion. Doing so can help reduce the incidence or severity of heartburn, though if it persists even with the ACV consider seeing a qualified healthcare practitioner as you may suffer from low stomach acidity. Finally this miracle worker has been shown in certain studies to help improve blood sugar balance, thanks to its acetic acid content. Balanced blood sugar is a crucial component for managing inflammation in the body and ensuring optimal health, glowing skin, and a body free from aches and pains. Bonus Pro Tip: ACV makes a great facial toner! Just combine 1 part ACV with 10 parts water and apply to your face with a cotton ball or pad to help clear up breakouts and balance skin pH. 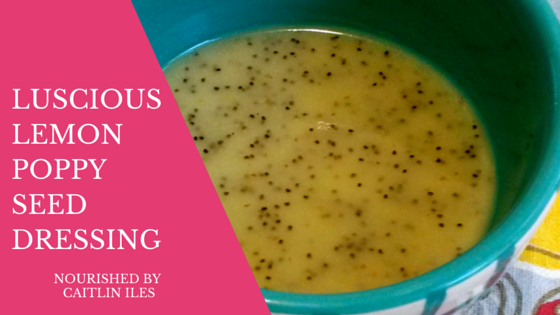 The poppy seeds that give this dressing its name are a great source of dietary fibre, which helps bind bile salts and toxins in the digestive tract and promote their elimination. These tiny little seeds also contain some great minerals, such as iron, copper, calcium, potassium, manganese, zinc and magnesium, all of which are necessary for many different enzymatic functions in the body and as cofactors for digestion. I also love the way they add a little pop of texture to salads. Alrighty, now that we’re aware of the sweet benefits of our summer dressing, let’s get to the good stuff, shall we? This recipe is super tangy and the perfect accompaniment to any light, fresh summer salad! Combine lemon zest and juice with apple cider vinegar, honey, mustard, and garlic. Blend together until using an immersion or stand up blender. Once smooth slowly drizzle in oil while blender is on low until fully emulsified with the dressing base. Stir in poppy seeds and season with sea salt to taste. Best if left to sit overnight in the fridge. Makes about 1.5 cups. So that’s my super simple Lemon Poppy Seed Dressing that will help you add a delicious pop to all the beautiful salads you’ll be creating with this summer’s abundance. Try playing around with some of the things you find in your cupboard. You never know what magic you might create!